Monday evening marks a landmark occasion as Ballinrobe celebrates 90 years of racing. From humble beginnings in 1921, Ballinrobe Racecourse has grown to be one of the leading tracks in Ireland. 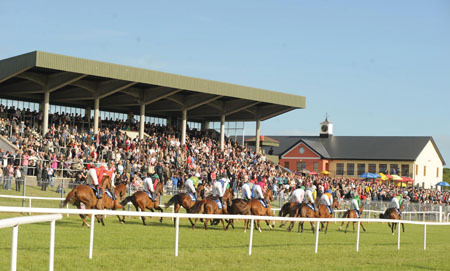 Its location, modern facilities and high standards in every sense have struck a chord with racing enthusiasts that has seen the Mayo track place its name high up on the racing calendar. To celebrate this occasion, racegoers are in for a host of exciting treats on Monday. The first paying 90 customers into the track will receive a free €10 bet with the on-course bookmakers. Monday is also Mad Hatters Day, which has a prize fund of €1,000 sponsored by ww.thefashionshed.com Paula Rabbitte of www.thefashionshed.com and Alan Murphy of Galway Bay FM will be judging the most quirky and creative hats and outfits on display. The €1,000 prize fund includes vouchers from Shine Boutique in Claremorris, thefashionshed.com and a headpiece by Fiona Mangan Millinery with lots of other goodies thrown in. Those with a sweet tooth are advised to be around The Pavilion to grab a slice of the huge celebratory cake. There is a special Ballinrobe Races 90th Anniversary Hurdle, with €16,000 in prize money sponsored by the race committee. Racecourse manager John Flannelly is looking forward to a great evening of celebrations in what is a major milestone for Ballinrobe Races: “It is great to reach our 90th anniversary. All credit is due to the committees down through the years for their work and great foresight during difficult times.We must pay tribute to the wonderful people who first set up racing in Ballinrobe back in 1921 and thank all those who have contributed to make Ballinrobe Racecourse what it is today. “It is very pleasing to be involved during these times. So much has been achieved and looking forward, there is still more to be done. By the time we get to our 100th anniversary we would hope to have one of the best tracks in the country with an excellent surface,” said Flannelly, who noted that 2011 has been a very good year, with great betting figures recorded. Racing gets underway on Monday at 5.50pm, though it is worth noting that one of the races may be split into two races, which would result in a 5.20pm start. The McHale Engineering Maiden, The Burleigh Accountants Handicap, The Costello McDermott Maiden Hurdle, The Ballinrobe Races 90th Anniversary Hurdle, The Tim Kelly Electrical Maiden Hurdle, and The Broderick’s Electrical Handicap Hurdle are all sponsored races for Monday’s card. Streetwise will provide the entertainment in the Carra Bar. There are great deals available on group bookings for the Coranna and Corrib Restaurants, with the latter offering admission, racecard, two-course meal and a €5 free bet, all for €30 in bookings of 10 or more people. Normal admission rates remain at €15 for adults, €10 for students and OAPs, with children under 14s free. Do not forget to follow the latest news on Ballinrobe Racecourse on www.ballinroberacecourse.ie and on Facebook.com/BallinrobeRaces Go for the racing – you will stay for the welcome. Page generated in 0.2170 seconds.